A cold northern winter with lots of snow is preferable; a horse’s coat gets fluffy, clean and sparkling all by itself and the unshod hooves shines clean. Over here the cold was recently overtaken by westerly winds and temperatures a few degrees above freezing, persistent rain and thick fog. 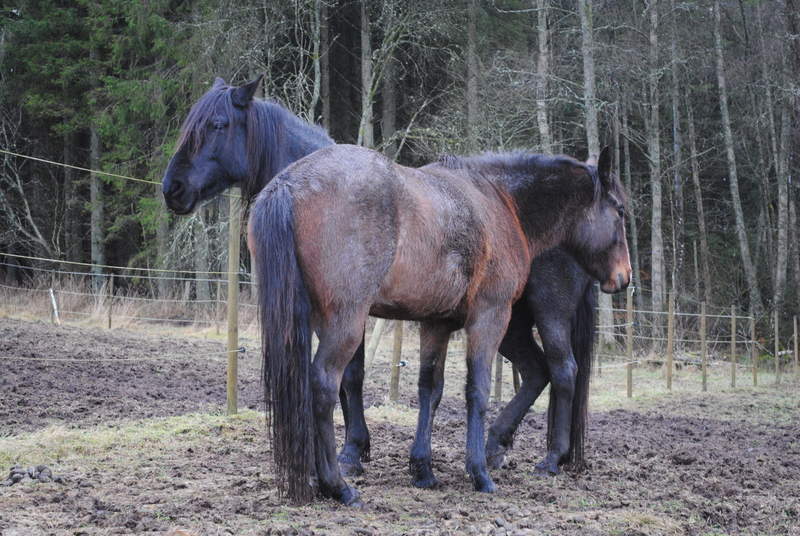 The perfect white ground transformed into a sea of mud; happens all the time, most every winter, here on the Swedish west coast; tough weather for any horse. Days like theses it’s inevitable to ponder about horses’ coat and skin and how they can stand the attack from all that cold wet mud. 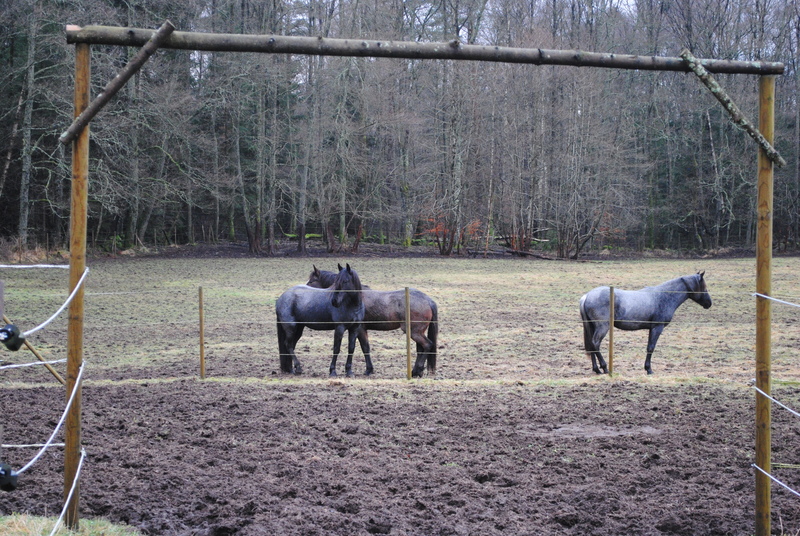 Most horses have no worries about rolling around or even lie down to sleep, in soaking wet mud. Since our horses live outdoors with an open stable which they use at their own convenience, they may choose to stay outdoors all night if they want to; and often they do just that. A horse’s coat is amazingly sophisticated. The condition of the coat is in many ways a reflection of the overall condition of the horse. Epidermis is the name of the outermost skin; a resistant barrier made of older cells. The deeper layer is called the dermis. That’s where the hair follicles are found, but also blood vessels, muscles and nerves. Oils are produced in the follicles and wander out over the skin to keep it smooth and elastic, the oil also makes the coat water repellant. The follicles also have comparatively strong muscle fibers that can raise the hairs to control the thickness of the surrounded air layer, thereby controlling the grade of insulation; a sophisticated temperature regulator. There are two types of hair; guard hairs that makes up the outer coat and the small fine hairs that make up the inner coat. 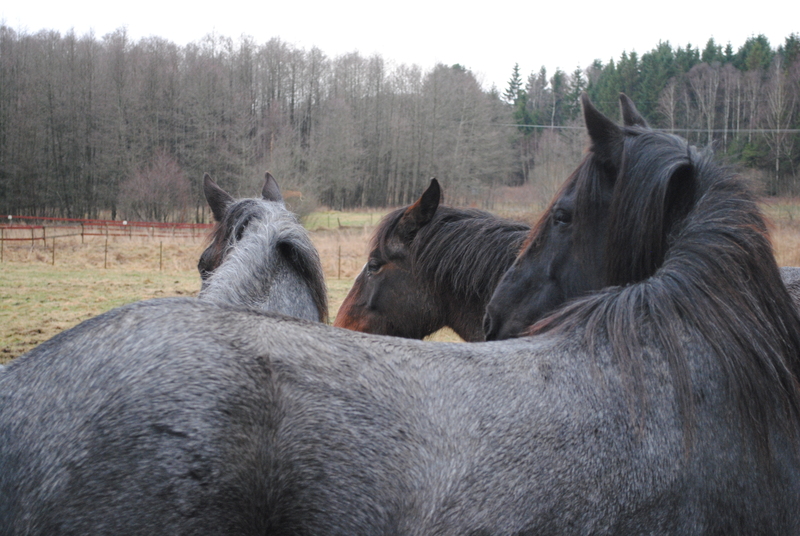 Even if the guard hairs are muddy and stick together the muscle fibers still work as long as the inner coat is clean. So don’t brush a wet muddy winter coat, it may just rub the mud into the innermost coat and spoil the insulation. Wait until the coat is dry, then it’s easy to rub off the mud. Another smart function is that of the blood vessels in dermis; they control the body’s heat loss by regulating the blood flow, they contract to conserve heat and widen to dissipate heat. The coat hairs grow in seasonal cycles and the shedding of hairs is controlled by daylight hours rather than temperature. We have noticed that here on these high latitudes the winter coat have a tendency to shed out relatively early in spring, when it still may be a risk of pretty cold nights. Fortunately there seems to be a comfortable margin for these Nokota coats. If the coat seems unusually dull it is important to find the source of the problem before it’s gone too far. The condition of the coat and skin is reliant on a wide range of factors so it can be tricky. A diet low on protein and fatty acids can cause problems. Other sources of troubles are; allergies, hormonal imbalances, kidney malfunctions or circulatory inefficiencies. Important nutrients for the coat and skin are; zinc, sulfur, copper, vitamin A, B, E, biotin, fatty acids, the amino acids methionine and lysine. Wrong iron levels may also be problematic. Note that an overconsumption, or imbalance, of various nutrients may be harmful. Worms or parasites can also affect the coat so check on it regularly, analyze and let your vet choose the right worm program. Garlic, as in the form of dried garlic flakes, is said to keep insects away in summer and it may also have an effect against worms. Wormwood leaves mixed with molasses is another cure against worms, though we personally haven’t tried it. Grooming is a way to help the horse dole out the natural oils, remove old hair and dead skin flakes. Don’t panic; if you’re too busy the horse will get help from her mates, or roll around on the ground and scrub it off against a tree or something else. Nevertheless the daily grooming is the perfect excuse for a thorough check on the horse against injuries or coat problems; above all it is a chance to do the horse a favor she really appreciates and we’d never miss that would we? Washing and shampooing is nice for a horse a hot summer day, but don’t overdo it since it may change the natural balance in a healthy coat system. 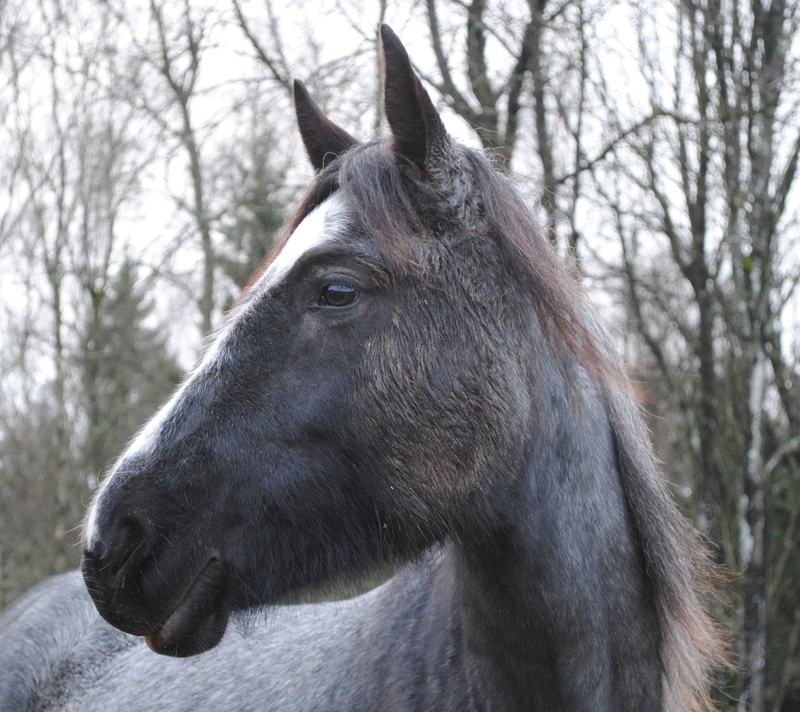 Over concern can be almost as bad as neglect, when it comes to your horse’s skin and coat. 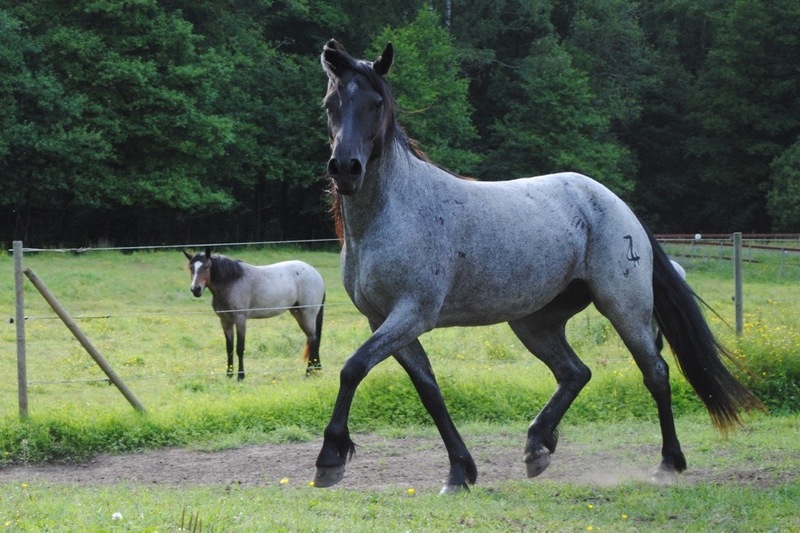 Horses are outdoor animals, even if there is a huge difference between domesticated breeds and wild bred horse breeds, like the Nokota horse. For thousands of years; every successive generation of human bred horses have been selected by various more or less conscious reasons, but wild horses’ only breed for survival, thru natural selection. Inheritance causing faulty coats or oversensitive skin is a great disadvantage; therefore it is very unusual among wild horse populations. This may be a generalization, but the power of health among wild bred horses can hardly be overvalued. One common objection to this is that a domesticated breed is especially bred for our purposes, for instance horseback riding, while a wild bred horse may well be unfit for such a purpose. One must then admit; wild bred horses breed only for the purpose of being horses, which then again is quite indispensable in horseback riding. Some breeds are developed in certain climates; Arabians in desert climate, Icelandic horses in arctic climate and Thoroughbreds in mild climate. Nokota horses have evolved as a wild horse population in the badlands of North Dakota in extreme inland climate; very cold winters and very hot summers; the most extreme combination. Inland climates are also known to be relatively dry, so does that make the Nokota horse more sensitive against a wet climate? Well I can tell you our horses won’t quit for some rain and wet pastures, but after a few days of the weather we’ve had lately even they are hoping for a change, let be for mental reasons rather than physical. What about blankets, aren’t they necessary for keeping horses dry, warm and clean? 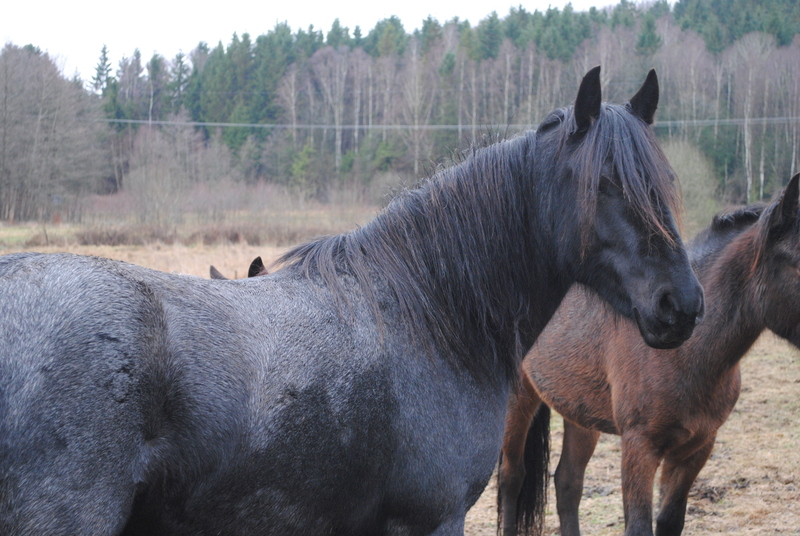 Horses like the Nokotas are equipped with an extraordinary winter coat. The outer coat layer is effectively water repellant and the inner layer is an outstanding water resistant insulation. Since the hairs in the coat barely absorb any water at all it works as something like a wetsuit for scuba divers, only better. The insulation provided by the coat in combination with the body heat will effectively evaporate the innermost coat layer and the surface of the skin will stay warm no matter what. The Nokota horses certainly endures ice cold rain, even in Scandinavian proportions. Domesticated breeds kept protected from extreme weather as well as breeds developed in hot climates may have too thin or ineffective coats, not well suited for cold, wet climate. 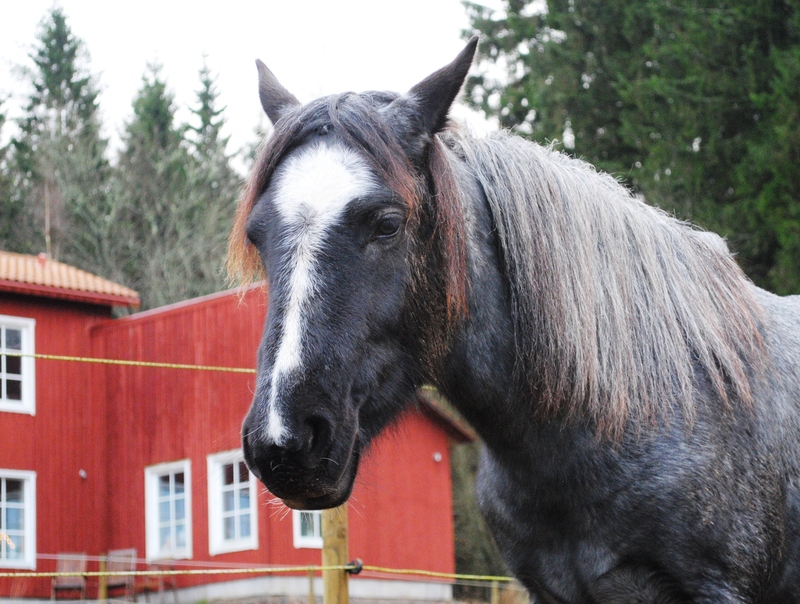 Older horses may not have the metabolic ability to develop a good winter coat in time for the cold season to arrive. These horses may absolutely benefit from blankets in some situations, but an excessive use of blankets may cause skin and coat problems. One thing we know for certain is that Nokota horses have thrived for innumerable generations without blankets.